Syracuse University Chancellor Kent Syverud addressed the University Senate for the first time in the 2017-18 academic year on Wednesday, Sept. 6. 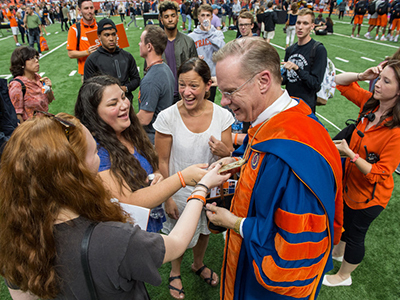 Chancellor Kent Syverud interacts with students and their families after the New Student Convocation on Aug. 24. During the meeting, Chancellor Syverud extended support to all members of the University community impacted by Hurricane Harvey and the impending Hurricane Irma. He also spoke on the University’s position regarding the change in the Deferred Action for Childhood Arrivals (DACA) program announced by the federal government on Sept. 5. The Chancellor offered thanks to staff, faculty and students on a successful Syracuse Welcome and provided updates on 2017-18 enrollment data, new faculty, new University leaders, year-end budget and fundraising and Invest Syracuse, among other items. Good afternoon and thank you, Ramesh. I am happy to report at the first University Senate meeting of the year. This is an important public occasion at the start of our year. I therefore acknowledge with respect the Onondaga Nation, the indigenous people on whose ancestral lands Syracuse University now stands. I have been asked by the agenda committee to restrict my remarks to 7 minutes. I’d like to extend sympathy and support to all members of our University community impacted by Hurricane Harvey in Southeast Texas and Louisiana, and to express concern for all those in the projected path of Hurricane Irma. We have nearly 120 students who are from the region affected by Harvey. Staff from many offices, including the Counseling Center and Student Assistance, are offering personal and academic services to our students to help them through this difficult time. Dean Brian Konkol is also overseeing a Syracuse effort to contribute relief to the affected areas. Yesterday, the federal government announced that it was rescinding the Deferred Action for Childhood Arrivals Program (DACA), while protecting beneficiaries until March 5, 2018, so that Congress can pass legislation. I wrote to the campus community yesterday about this sad decision, which our University joined in opposing. We have DACA beneficiaries among our students and they are as Orange as any of us. They need our help and support. Let’s not let them down now. I want to thank the many folks in this room for making Syracuse Welcome such a successful experience for more than 5,000 new students. I think it was the best Syracuse Welcome ever. We welcomed first-year, transfer, graduate and professional students. We’ll report more on graduate and professional enrollment at a future meeting. For undergraduate enrollment, the news is good. We are projecting that this year’s entering class is slightly smaller (which was our goal), more diverse and has stronger academic qualifications on average than last year. We have enrolled approximately 3,630 incoming freshmen, which is about 75 less than last year. The total number of incoming freshmen of color increased by approximately 74: 960 students of color today versus 884 students of color this time last year. Twenty-six percent of the total new undergraduate student population at Syracuse are students of color—up from 24 percent last year. About 20 percent of incoming students are first-generation college students and roughly 75 percent of Syracuse students are receiving some form of financial aid. New undergraduate students represent 46 states, along with Washington, D.C., Guam, Puerto Rico and U.S. Virgin Islands, and 53 countries. In addition to new students, we also welcomed many new faculty this semester. I have met many new part-time faculty, and this morning we formally signed the University’s new agreement with our part-time faculty union. I thank everyone on the teams that reached that agreement. We have 90 new full-time faculty last week, including tenure and tenure-track professors as well as teaching professors and professors of practice. Last year the number was 86. Slightly more than one-quarter of the new faculty identified as faculty of color. Dara Royer, Senior Vice President and Chief Communications Officer. All have brought skills and experience to campus that will enhance the student experience in unique and diverse ways. I look forward to working with them and encourage you to get to know these new leaders. We are now two months into our almost $1.4 billion fiscal year 2018 budget. We closed out fiscal year 2017 fairly well. We had a $1.3 billion FY17 budget. When the budget year closed on June 30, 2017, our revenues were roughly $6 million less than we expected. This was mostly a result of shortfall in fall 2016 enrollments in master’s programs. Our expenses were $21 million less than budgeted, primarily because of lower than budgeted health benefit and workers compensation costs. Overall, in FY17 we ended with a truly balanced budget with a 1% surplus and without net use of carryovers. The fiscal year 2018 budget also projects net positive results without a net use of carryover funds. Fund-raising efforts continue on an upward trajectory. Our fiscal year 2017 goal was $125 million in new business. We finished the year with $125.76 million, making our goal. That’s a 25 percent increase over FY16. We have set FY2018 goals of $150 million (another $25 million, or 20% increase). That is ambitious but achievable. Our endowment, after remaining essentially flat for a long time, is again now growing. Investment performance for the Total Managed Endowment was 12 percent for FY17, a significant increase. Our total endowment passed $1.25 billion this summer for the first time. Last month, we introduced Invest Syracuse to the University community. The $100 million initiative aims to provide all students with a distinctive, world-class learning experience that prepares them for professional and personal success. It will provide financial support for the implementation of various priorities as identified by the Academic Strategic Plan. Expand opportunity to students of talent and promise from across the socioeconomic spectrum. $30 million in additional tuition revenue, including a tuition premium increase for first-year and transfer students entering in the fall of 2018. This is not for any current students. Critical to this process is your participation in the priority setting process. Yesterday, the team working on Invest Syracuse hosted the first of three engagement sessions. There are still two more engagement sessions: Sept. 20th and Oct. 3rd. Both events will be held in Goldstein Auditorium. Additionally, next week, the Senate will host a special meeting focused exclusively on Invest Syracuse. At that time, you will hear from Provost Michele Wheatly; Dolan Evanovich, Senior Vice President for Enrollment and the Student Experience; Amir Rahnamay-Azar, Senior Vice President and Chief Financial Officer; and Matt Ter Molen, Senior Vice President and Chief Advancement Officer. There is also a lot of ongoing, important work that many of you have helped with on the Diversity & Inclusion Council, the Task Force on Sexual & Relationship Violence, the Ad-Hoc DACA Committee and the Campus Facilities Advisory Board. I’ll report more on each of those next meeting. There is still a lot to do. In just over a week, from Sept. 14 through Sept. 17, we will be celebrating out 12th Coming Back Together reunion, which focuses on our African American and Latino alumni. It will be our largest CBT ever, with about twice the attendance of the last one in 2014. Eight hundred attendees have registered so far. I urge you to make time to attend some of the events. There are many to choose from. So, it is a challenging environment right now, and it will continue to be challenging. I’m not referring to hurricanes. Nevertheless, you’ve helped Syracuse University progress in many ways. Thank you for all of your help.